One of my family treasures is an old rolled photograph. It’s crumbling a bit after being held flat in a book for several decades. I’ve made copies of it so as not to loose it completely. The photo was taken in 1938. All the employees of Westinghouse Electric Manufacturing Company’s Porcelain Division are gathered in front of the building at 6121 Green Street in Emeryville, California. 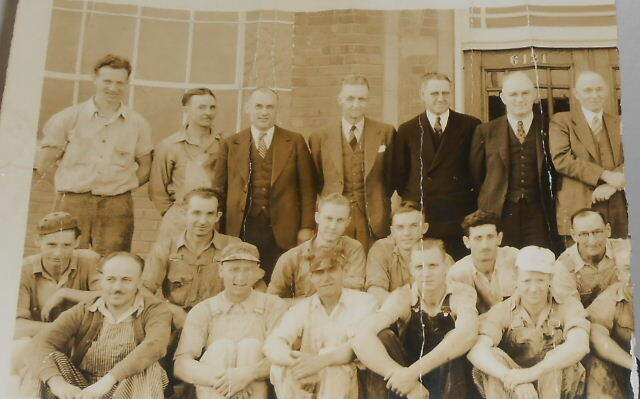 This 1938 class of employees includes my grandfather, Joao “John” Pacheco Smith and his cousin, Manuel Bonita, Jr. They are pictured on the right standing–no, not the men in the suits. My grandfather is third from the right and his cousin is fourth from the right. 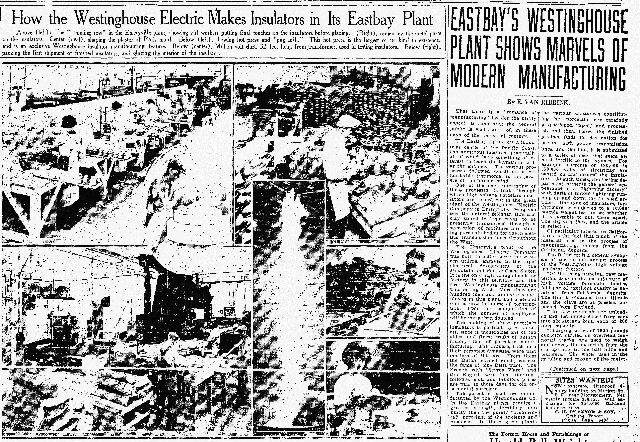 I did some research and found that Westinghouse Electric expanded from San Francisco to Emeryville (next to Oakland) in 1921. They bought 12 acres which would house several buildings for electronics manufacturing. The San Francisco and Los Angeles locations housed sales offices, warehouses, and repair facilities. This would add considerably to their Bay Area holdings. The plant was a big deal. It brought jobs to the area and added to the growing influence of the East Bay in manufacturing. This spread in the 23 Mar 1924 Oakland Tribune tells you just how important it was. The Oakland Tribune reported on the importance of their operations in the Bay Area. As electricity became the main source of powering our buildings, street lights, machinery, and so forth, there was greater need for the materials needed to make it happen. The Emeryville location produced high voltage porcelain insulators used in electricity production. Demand for Westinghouse Electric’s products grew in the next decade. Changes within the San Francisco Bay Area made manufacturing in the area more palatable. In 1936 the Oakland Bay Bridge opened allowing for a shift in how materials were transferred between locations across the bay. Everything was transported by ship up to that point. Now they could utilize the bridge to shorten that gap. 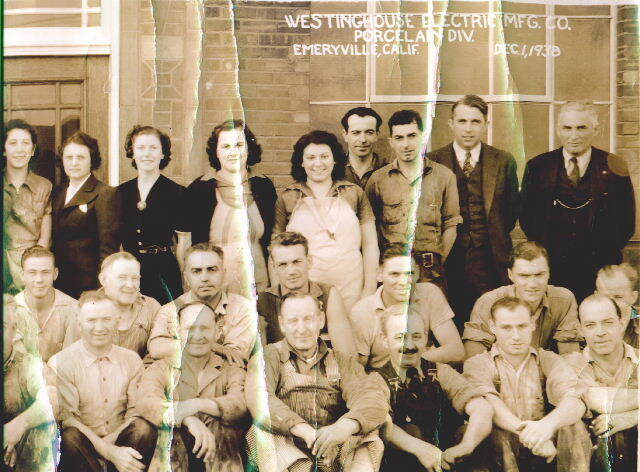 In 1941, when the US entered WWII, Westinghouse Electric was part of the war effort. In the Emeryville plant they made “electrical apparatus” — whatever that means! My grandparents moved to Spreckels in the early 1930s to follow the work. There was plenty to do on the Spreckels Sugar Beet farm and other farms in the Salinas area. My grandfather worked on the sugar beet farm and my grandmother was a helper at a beauty salon and cleaned houses. They stayed a couple of years then moved back to Oakland in 1937. Truth be told, my grandma was a city girl. I don’t think she really care for rural life. And, this is when my grandfather was hired by Westinghouse Electric. I am not sure exactly what his work entailed, only that he was a laborer a noted in the 1940 U.S. Federal Census. Whatever work he did, it was in the porcelain division working on those high voltage insulators. Westinghouse Electric’s hay day eventually ended. As an aside, they left behind a toxic mix of asbestos and other chemicals. Because of the contact with asbestos, some employees developed health issues that come along with exposure. The Emeryville location was later designation as a super fund site. There are still complaints about the soil today. I found that they are trying to turn the location into a transportation hub. As with all business, things eventually come to an end. And, then those locations are turned into something different for the next generation. Photograph of Employees. Westinghouse Electric Mfg Co., Porcelaind Division. Taken 1 Dec 1938, Emeryville, California. “East Bay’s Westinghouse Plant Shows Marvels of Modern Manufacturing”. The Oakland Tribune [Oakland, CA]. 23 Mar 1924, Development Section, page 97-98, column 4-1. “Westinghouse Expansion“. Pacific Marine Review, August 1921, volume 18, page 107.